Today I’m happy to introduce you to a fellow Canadian food blogger that I like a lot, Dana from Killing Thyme blog. 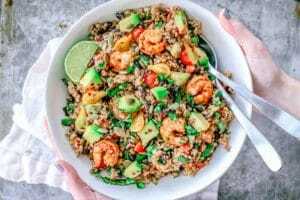 She’s created this delicious Shrimp and Quinoa Salad with Chipotle Vinaigrette especially for you! I will let her introduce herself below. 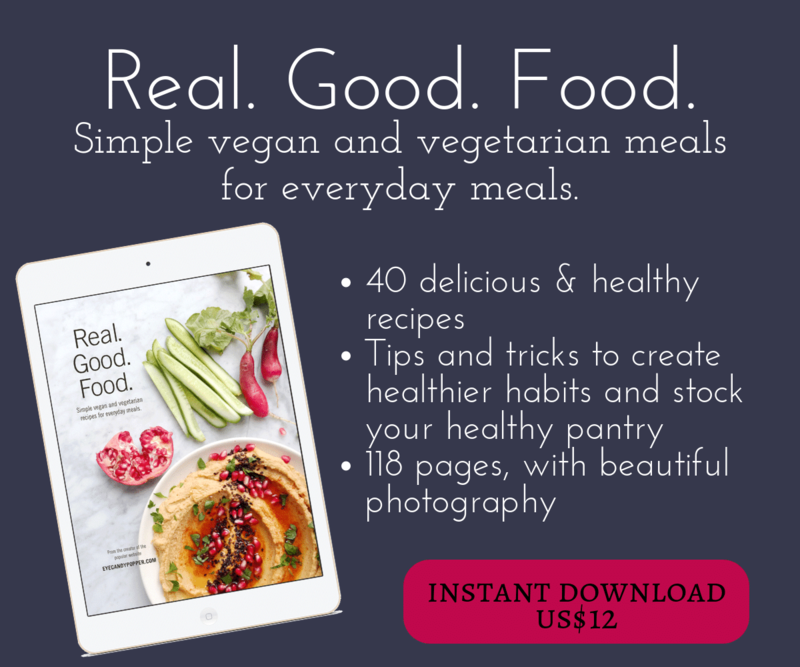 I also created a special recipe for her blog, click on the link at the bottom of this post. Hi! 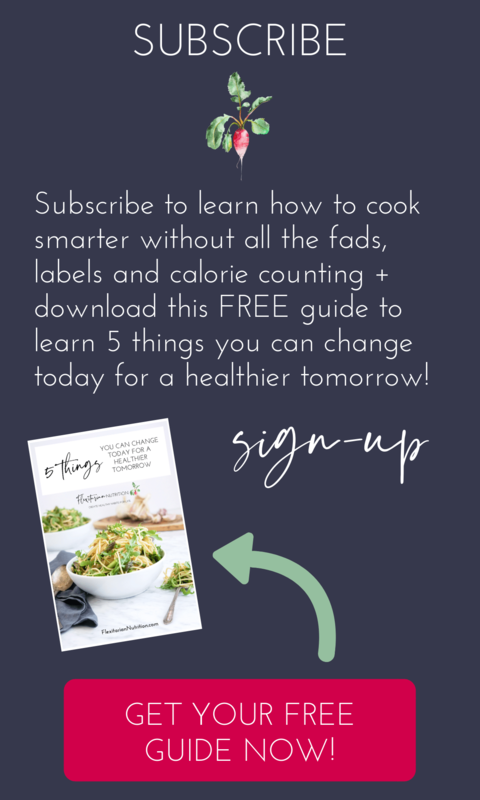 I’m Dana of Killing Thyme, a pescetarian food blog, and I’m thrilled to be sharing my eats with you today here at eyecandypopper.com. One of my favorite things about the food blog experience, aside from spending my days cooking, photographing, eating, and writing about food, is the relationships I’ve formed with fellow bloggers over the years. We teach one another, we inspire one another and, a lot of the time, we keep one another sane; we deter one another from throwing in our dish towels. Needless to say, when Gabrielle, aka ECP and I started toying with the idea of collaborating and writing a guest post for one another’s blog, I was pretty jazzed. After all, we’re both passionate about sustainability and healthy choices; the collaboration made sense. She created a nom-worthy Maple Baked Pear and Walnut Breakfast with Granola Since for my blog and, since my main focus is the pescetarian diet, Gabrielle thought it would be a good idea to bring something fishy to Eyecandypopper — but not too fishy! I’m talkin’ some juicy, easy-to-devour Alaska-caught shrimp. Shrimp is the most consumed type of seafood in the US, so it’s important to shop for it responsibly. Unfortunately unsustainable options are more common and more easily available than sustainable ones. Always look for “Best Choice” shrimp; the majority of “Best Choice” is caught in Alaska, but there are other good options — both wild and farmed. You can also look for “Sustainably Caught”, “cCertified Sustainable Seafood” or “Good Catch” designations. Knowing where any of your seafood comes from, as well as the difference between good and bad fishing/farming methods, is critical. If you aren’t sure, talk to your fishmonger. 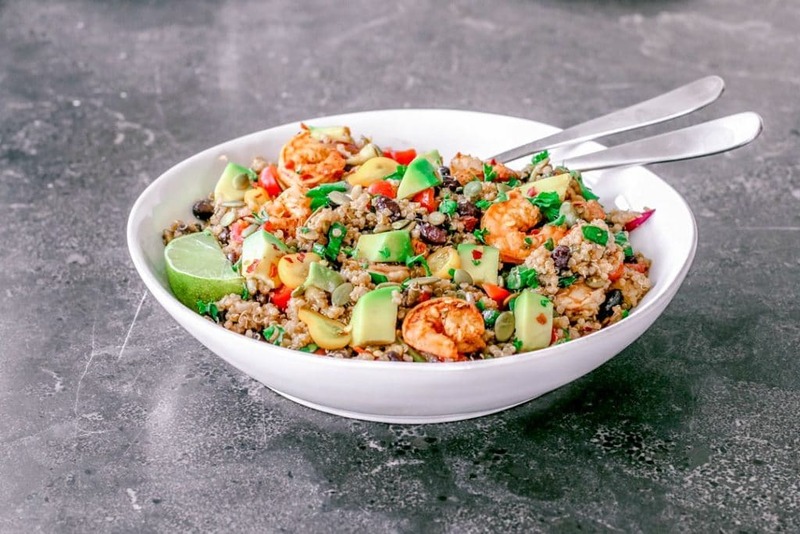 This recipe brings a lot of great things together: sustainable shrimp and fresh little homegrown tomatoes from my garden; smoky heat and a slight sweetness; creamy avocado chunks and crunchy pepitas. Though this salad is new, I can easily call it my favorite. It makes for a great contribution to any gathering, it’s a fabulous dinner side, and a nourishing light lunch. 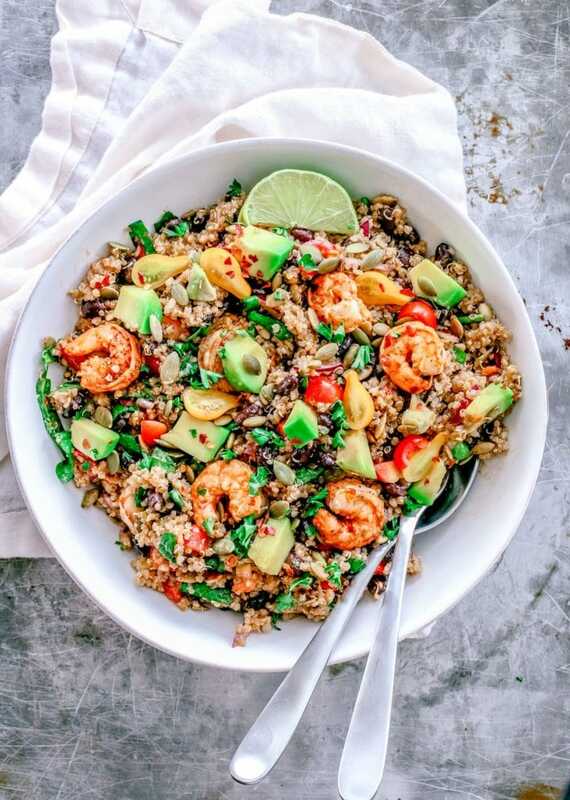 If you’re not big on shrimp, or can’t source any sustainable varieties, you can skip them, making this a vegan salad. Thanks for taking the time to welcome a new voice here at Eyecandypopper! Don’t forget to check out ECP’s Maple Baked Pear and Walnut Breakfast with Granola recipe that she created especially for Killing Thyme. A simple and fresh salad for everyone to enjoy for lunch or dinner! In a medium saucepan, add vegetable broth, quinoa, garlic powder, cumin, coriander, and salt. Stir to give it a quick mix, and bring to a boil. 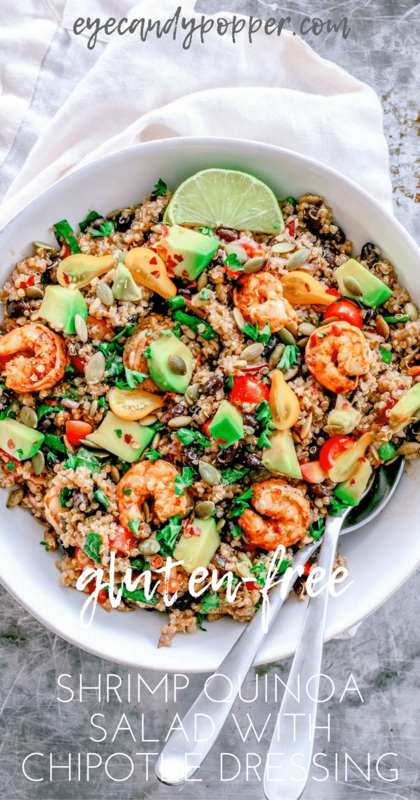 Once boiling, reduce heat to low, cover, and simmer until quinoa is tender and most of the liquid has been absorbed, approx. 15 to 20 minutes. Fluff with a fork. Set aside. Place all of the ingredients for the dressing in a blender, and blend until cohesive. Taste, and adjust the seasoning and heat to your preference. Set aside. Heat 1-2 tablespoons of cooking oil of your choice in a skillet. While that heats up, place shrimp in a bowl and toss with chili powder, lime zest, lime juice, and chili flakes until evenly coated. Once the oil is hot, carefully add the shrimp to the pan and cook for approximately 3-4 minutes or until opaque, turning once halfway through. Shrimp doesn’t take long to cook, so be careful to not overcook it otherwise they will have a rubbery texture. Once ready, remove from heat and set aside. 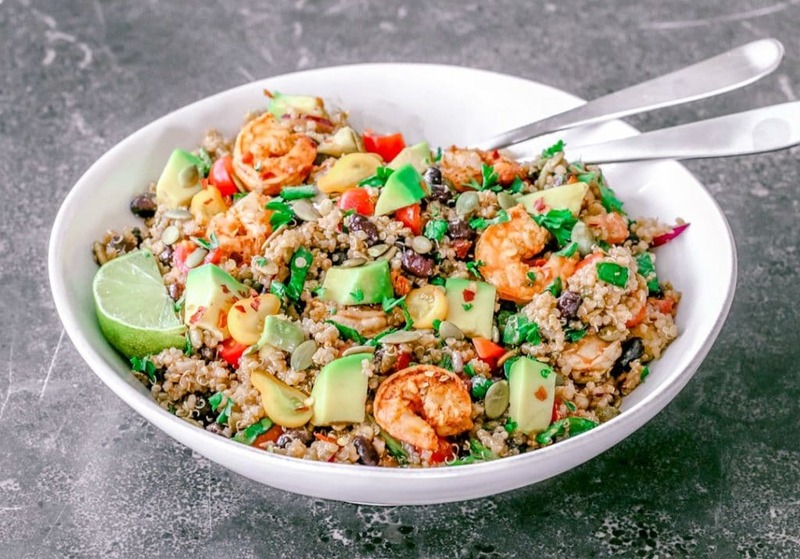 Add the cooked quinoa to a large bowl along with the black beans, toasted pepitas, spinach, avocado, onion, tomatoes, and shrimp. Add half of the dressing, and toss to coat. Taste. If you feel it needs more dressing, add more to your taste. Look for sustainably caught shrimps. Looks delicious and I love me some chipotle!! For Canadians buying seafood in the BC region, always look for the ‘Oceanwise’ symbol for the most sustainable seafood. On of my favourite things about blogging, too, is all the wonderful people I have met through blogging! I never would have expected it, but it’s such a pleasant surprise! P.S. I love that you are collaborating together because I love what you both do! Thanks! 🙂 That’s good that you’re paying more attention to sustainability when it comes to seafood! Quality makes a big difference, and farmed shrimps are usually pretty gross. haha I found a brand that sells wild-caught shrimps with a sustainable program and on top of that they don’t add any salt or phosphates! Winner! Love the fishy (but not too fishy!0 😉 side of this collab, ladies! Sustainability is so important and it’s great to see bloggers spearheading the issue. This salad looks just perfect! I love the the combination and freshness of the ingredients, and that chipotle vinaigrette sounds amazing. Beautiful work!